Answer all calls from a single device. With up to triple connectivity for softphone/PC, desk phone and mobile devices. Use the base station as a gateway to your preferred audio sources. 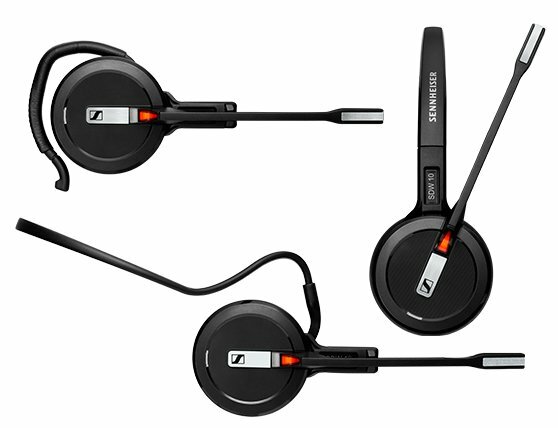 With a choice of three FlexFit™ styles – a headband, ear hook and neckband solution, SDW 5000 series delivers a perfect customized fit. SDW 5000 allows users to choose their own constellations using the base station as a gateway to their preferred audio sources. 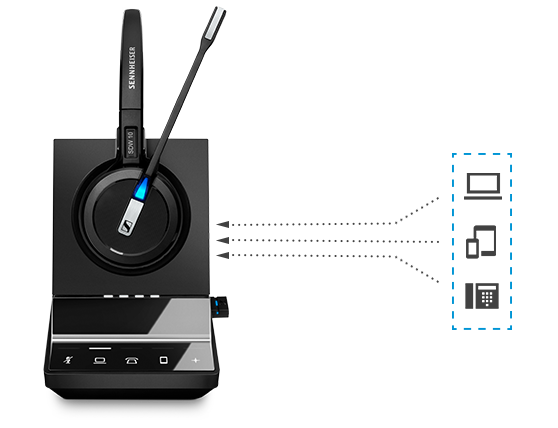 It’s also possible to connect a wired Sennheiser headset/speakerphone or a Bluetooth® headset using the USB port on the base station. With the SDW 5000 Series IT managers can cater for hot desking or flex-working needs and downgrade/upgrade users’ mobile connectivity via the BTD 800 dongle according to the users’ needs.